PDF editor can be a handy tool if you regularly review and update your documents. For example, if you scan a document with OCR and some words are unreadable, you can use this PDF editor to edit the text. There are many PDF editor tools created by different companies. Almost all support the same basic functions, but some have extra features that others don’t have. The following are the 6 best PDF editor software. Sejda PDF Editor allows you to edit preexisting text as well as the text you add yourself in the PDF document. It supports many basic functions such as insert/remove pages, insert images, draw shapes, and add signature. The white out feature allows you to draw a white box to hide information. You can load PDF into the software by URL or cloud services like Dropbox and Google Drive. Link you sent to the cloud storage will expire in a week. The PDF editor can run on the browser and is also available for download as desktop version. The online version will automatically expire session after 3 hours. Movavi PDF Editor is a basic PDF editor that integrates a drag and drop interface for opening the documents. You must first Download PDF editor before using it. It offers basic functions like merge documents, rotate, copy/paste, and add blank page. You can use the text tool to draw an editable region on part of the document that contain the text you want to edit. Images can be deleted and replaced with other images from your computer. It supports input of signature via a signature software on a tablet, and digital signature image. In the view mode, you can read your PDF in a large preview page. PDF-XChange Editor features OCR capability to identify the text of the document you scan. It allows you to load documents from various sources such as computer, URL, SharePoint, Google Drive, and Dropbox. All tools are categorized into sections to allow you to easily find them. You can add shapes, images, and QR codes in the document. You can highlight all the fields in the form to make it easy for you to fill in the information. Some features are only available in the premium version called PDF-Xchange Editor. The premium version lets you add text and polygonal shapes without watermark. PDFsam Basic, where sam stands for splitting and merging, is a simple PDF editor with a user-friendly interface. It allows you to cut large documents into chunks, and extract pages you need into a single PDF. It has a rotate tool for rotating pages that you scan upside down. Many of the features in the free version is time limited. It does not support any tool for editing the document content. The premium version offers extra features like OCR and signing documents. PDF Element Pro is a ribbon style PDF editor equipped with a full range of features. The entire PDF automatically becomes editable when you load it into the software. You can edit the PDF page in any way such as insert/delete/rotate/extract information. Pages can be cropped to remove unnecessary content. 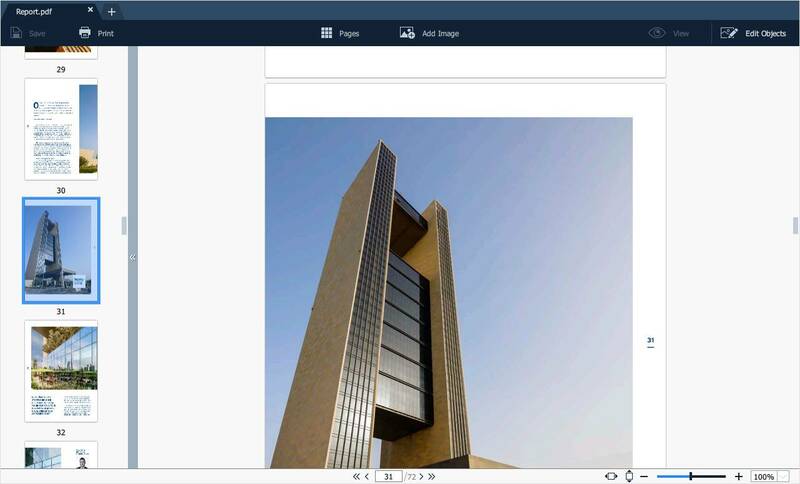 Multiple images and PDF documents can be merged together into a single PDF documents. It also supports password encryption feature to protect PDF with sensitive information.